In honor of our newest creations, we have whipped up a quick recipe to share with you all! It’s quick and easy! How easy? Well, there is only four ingredients in it! We wanted it to be short, sweet, and to the point! It definitely has all the fall flavors wrapped up into one light and fluffy dessert! 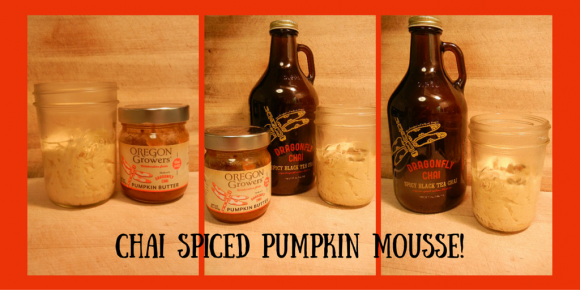 If you aren’t in the mood for pumpkin, you can always substitute by using our Dragonfly Chai Spiced Apple Butter instead! This recipe would be pared well with maple or pecan flavored cookies, spiced candied nuts or pumpkin seeds for an added crunch! In a clean bowl and using a clean whisk, whisk the egg whites until they are foaming and turning opaque. Gradually add 1 T. of the sugar. Once soft peaks start to form with the egg whites, gradually add the rest of the sugar. Gently, fold the Chai Spiced Pumpkin Butter into the whipped cream. Don’t mix completely, you still want to see white streaks. Gently, fold the whipped egg whites into the whipping cream mixture and fold until combined. Chill for about 15 minutes and serve immediately.